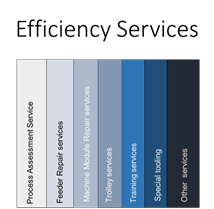 SMT SERVICES Efficiency Services offers you true value for money. While your machines are running in best conditions, you continuously need attention to go to the next level of manufacturing. With a high level of knowledge transfer and customized solutions we are prepared to support you. Depending on your requirements you can order specific tooling, parts, repair services or training. When you are looking for professional advice, one of our experienced engineers will take a thorough look to the equipment and its intended function in your production environment. If you follow this advice you will be able to maximize your machine performance. Process Assessment Service: Experienced, qualified SMT SERVICES personnel will check the state of your SMT equipment. The outcome of this will be used as input for an improvement report or direct you to new modifications, parts or tools. Feeder Repair Service: This repair service will immediately result in better feeder performance and less component waste. Machine Module Repair Service: Various suppliers give you the opportunity to repair on lower level your equipment, which results in better performance with lower repair cost. Trolley Services: This service is related to Feeder Repair Service and will immediately result in better feeder performance and less component waste. Training Services: High performing equipment only results in high quality and output when your team has the latest and highest level of knowledge. We can offer you customized training services. Special Tooling: Depending of your equipment we can offer you various tooling solutions which will help you to go to the next level. You can contact us and inform us about your wishes and needs. We will inform you with our solution proposal. You can make your own decisions and order the services when you are ready. Your SMT SERVICES call centre will take care of all the necessary actions with respect to your request for Installation Services.